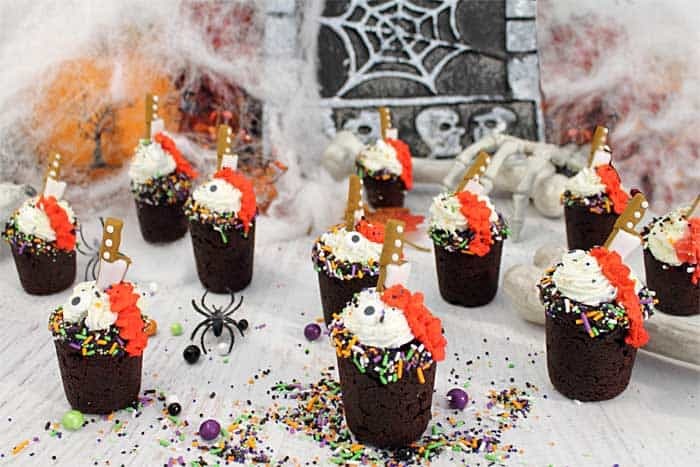 Spooky and delicious Halloween Chocolate Cherry Cookie Shots are perfect for holiday parties. The cookie shots are made of a rich chocolate cookie and filled with sweet cherry pie filling or your favorite shot. 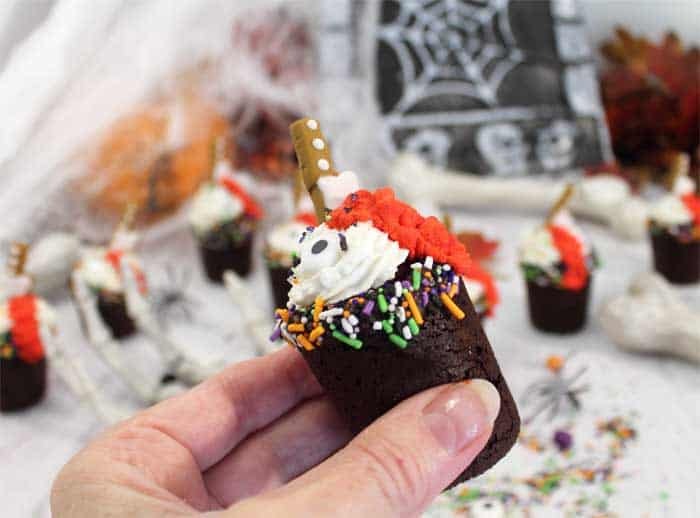 Top them with whipped cream, a bloody knife and colorful Halloween sprinkles to complete an awesomely gruesome dessert. One that’s oh so delicious and, when you’re done, just eat the glass. I received a sample of sprinkles from Pop Sprinkle. All opinions shared are 100% my own. 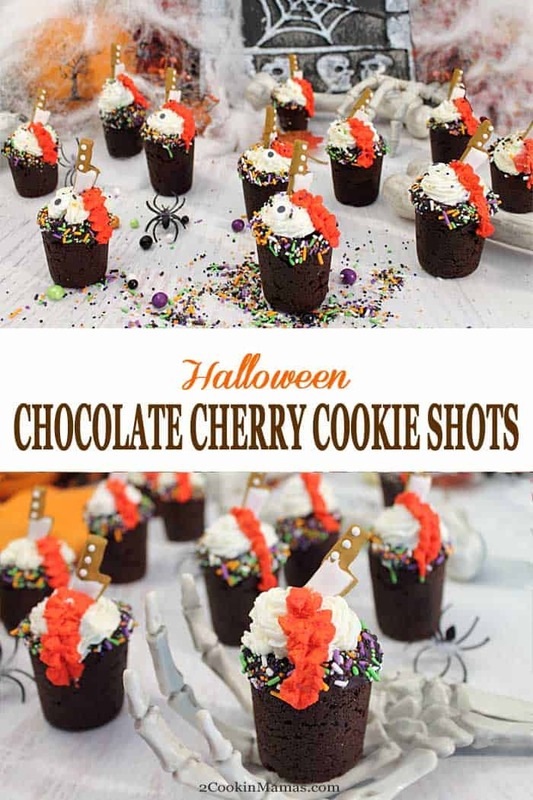 I’ve always wanted to make cookie shots and #Choctoberfest seemed like the perfect time to give them a shot. haha I just had to say that. If you haven’t check into my blog for a while you might not have realized how much chocolate deliciousness was going down this week. Over 100 food bloggers are working their way through just about any chocolate recipe imaginable, from snacks like my own Chocolate Yogurt Hummus or this Halloween Monster Crunch Popcorn, to lunches made of White Chocolate Butternut Soup, to unbelievable dinners like this Chocolate Beef Stew. 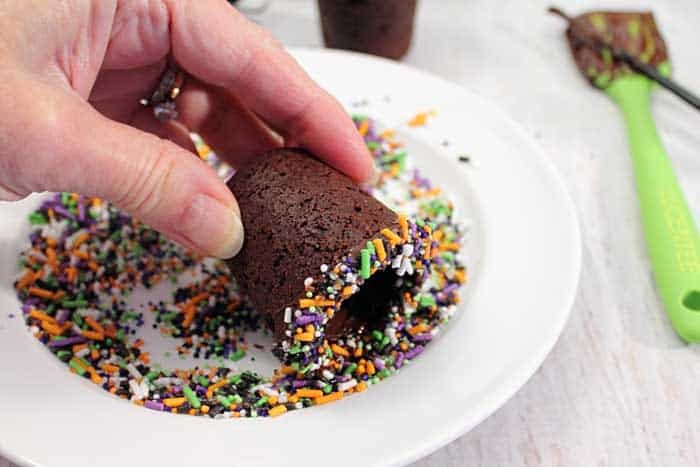 Of course, when you hear chocolate you automatically think of desserts and this fantastically delicious looking Halloween Gluten-free Cake Roll stands out from the rest. OK, now back to my cookie shots. 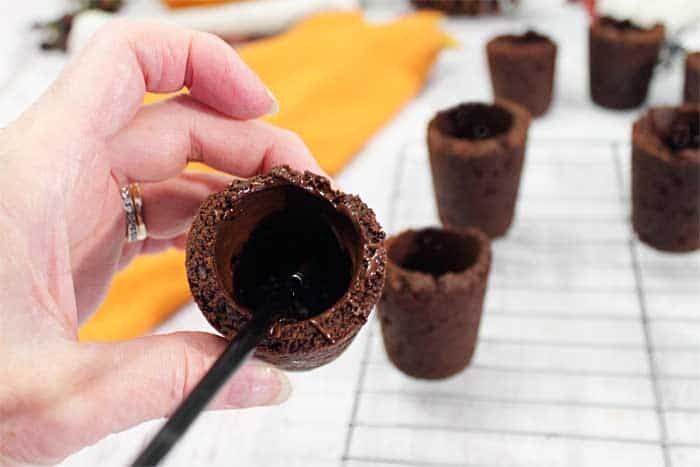 These eatable shot glasses are pretty easy as long as you have the mold and the right recipe. 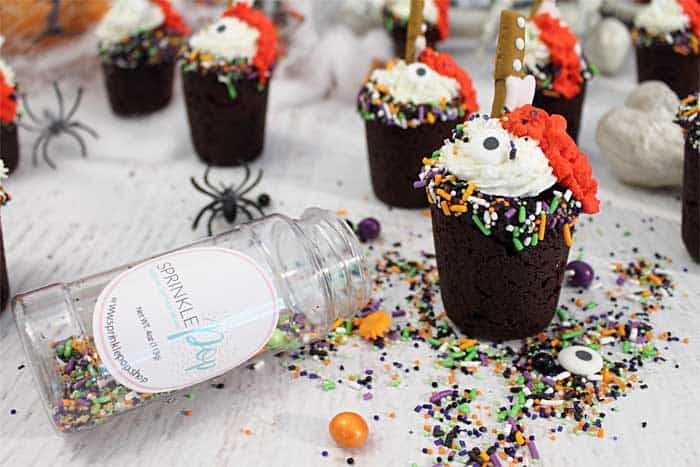 And with Halloween around the corner and a bottle of colorful and kind of creepy Halloween sprinkles from Sprinkle Pop I knew I was going to do something ghoulish. Something with red blood, I mean icing, and scary googly eyes and ghosts and knives floating around. Step-by-Step directions for the perfect Chocolate Cherry Cookie Shots. Combine the flour, cocoa, both sugars and salt together. Melt butter and whisk in 1 egg yolk and vanilla extract. Dough should be very thick and have a smooth texture. 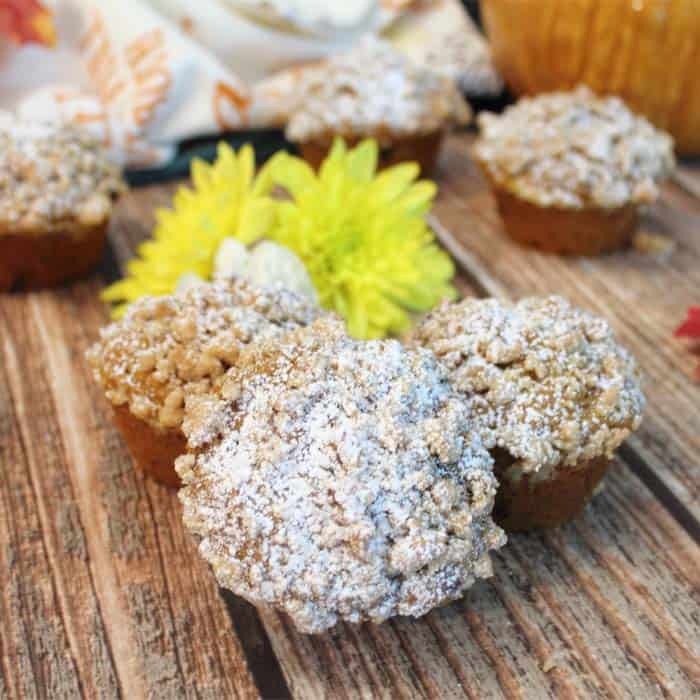 (These can be made without the chocolate chips too and I think if I were putting in a liquid shot I would leave them out. After spraying the mold and inserts with a nonstick spray, place a ball of dough (I used a medium cookie scoop) into the bottom of each cavity. Place insert into each cavity, making sure it is in the middle, and pressing all the way to bottom. Bake and trim excess off top as soon as they are out of the oven. Twist insert and remove cookie shots to wire rack to cool completely. Now the secret to making the shots leak-proof is to paint the inside with melted chocolate and wait for it to harden. Make the chocolate thick enough so it covers any cracks in the cookies. Put a little extra around the rim of the cookie shot and dip into your favorite sprinkles. 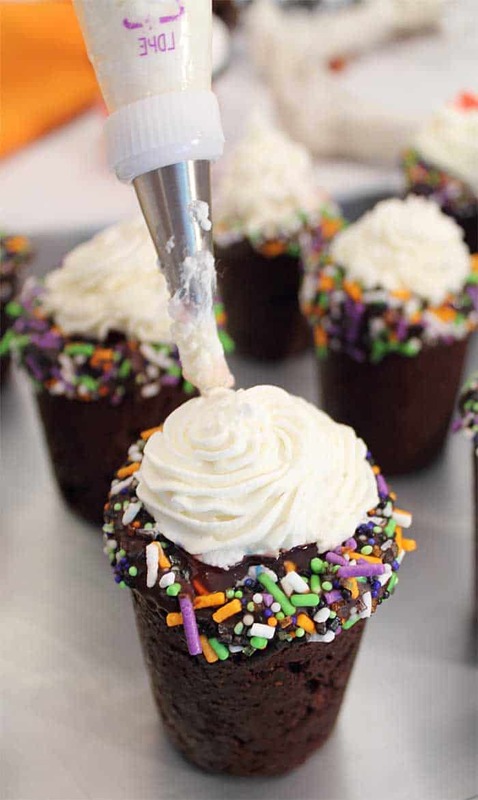 ‘Cause sprinkles always make the perfect finishing touch. I love the Monster Mash-up Sprinkle mix I received from Sprinkle Pop. It’s full of ghosts, googly eyes, pumpkins and the basic Halloween colored sprinkles. Sprinkle Pop will even create custom sprinkle blends, dyed in house to match any idea you may have. Their slogan, if you can dream it, they can create it as a sprinkle mix. Pretty cool right! I’m already getting some ideas for Christmas. OK, now that the cookie shots are cooled and the chocolate dried, it’s time to add something in them. At this point, you can either add a nice shot of your favorite liqueur, like Cointreau or Grand Marnier or you can add cherry pie filling and the whole family can enjoy them. I’ve had both the shot, the cherry pie filling and cherry pie filling with a little Cointreau in it and they’re all good. Nothing like being able to eat the glass (and a chocolate one at that) when you’re done so there’s no cleanup. Pipe on some whipped cream. Then pipe on some scary blood, well, it’s just some red tinted whipped cream or you could use the cherry gel that’s in the cherry pie filling. 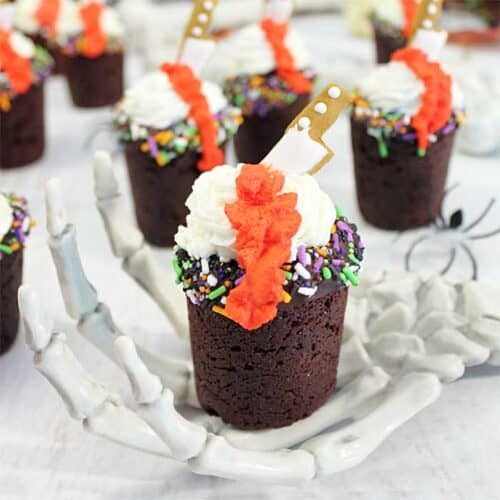 Top it with a knife and the scary cookie cups are ready to eat. Aren’t they scary? 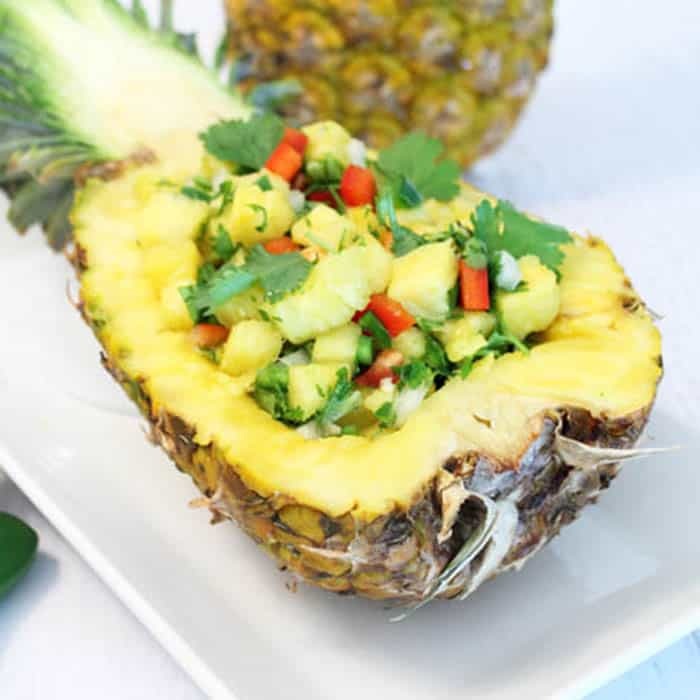 Don’t you just want to take a bite? Go ahead! They really are a chocolate cherry delight. Set the scene for a Halloween party complete with spider webs, tombstones and rattling bones. Now let’s give these cookie shots a hand. I must be feeling pretty fiesty today with all these double meanings thrown in. Enjoy! 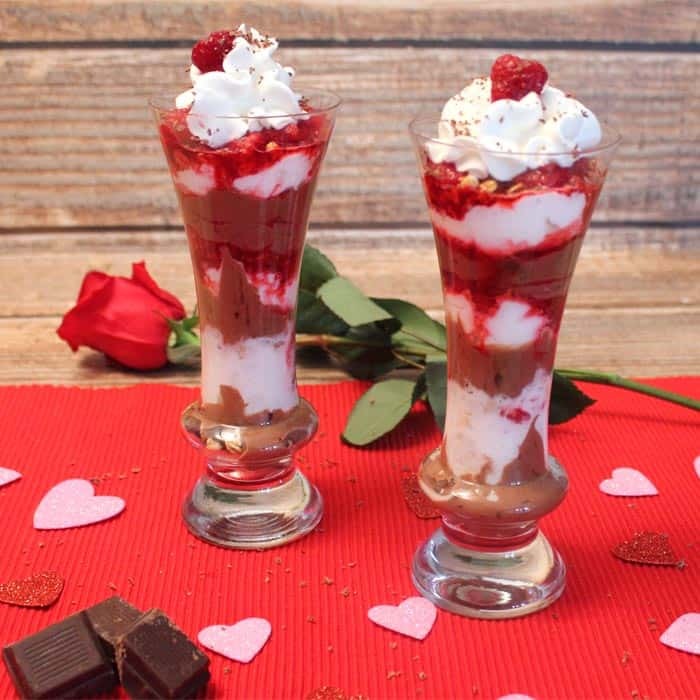 And while you’re enjoying your chocolate cherry cookie shots, check out more chocolate deliciousness below and don’t forget to enter the #Choctoberfest giveaway below for your chance to win over $400 in sweet goodies. They’ll come in handy with the holidays just around the corner. 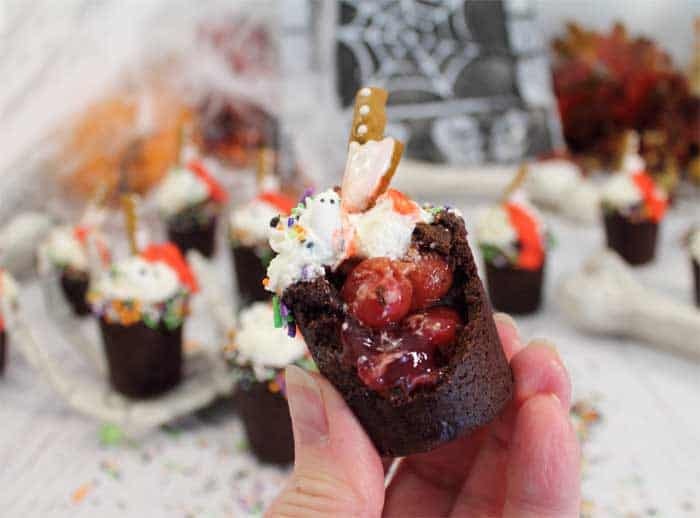 Spooky and delicious Halloween Chocolate Cherry Cookie Shots are perfect for holiday parties. 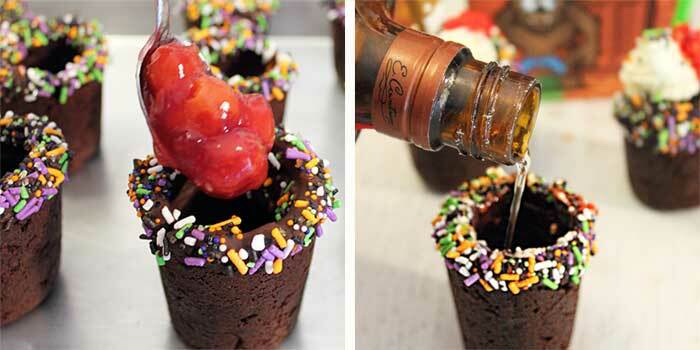 The cookie shots are made of a rich chocolate cookie and filled with sweet cherry pie filling or your favorite shot. 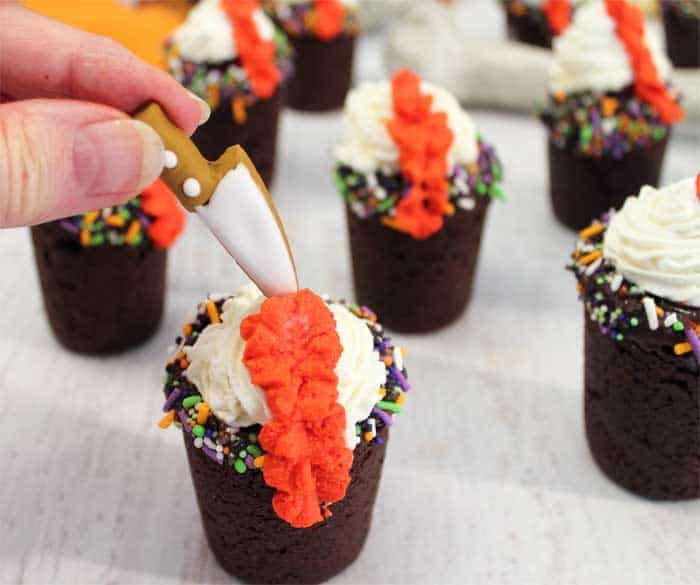 Top them with whipped cream, a bloody knife and colorful Halloween sprinkles to complete an awesomely gruesome dessert. Preheat oven to 350 degrees. Spray cookie mold cavities and inserts with nonstick spray. 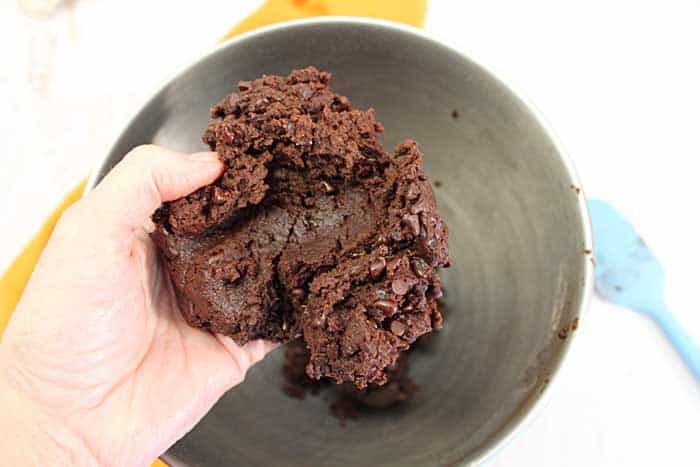 Combine flour, cocoa powder, both sugars, salt and baking powder in a large mixing bowl. Melt butter in a microwave safe bowl. Let cool slightly. Whisk egg and vanilla extract into butter. Pour butter mixture into dry ingredients and mix well. 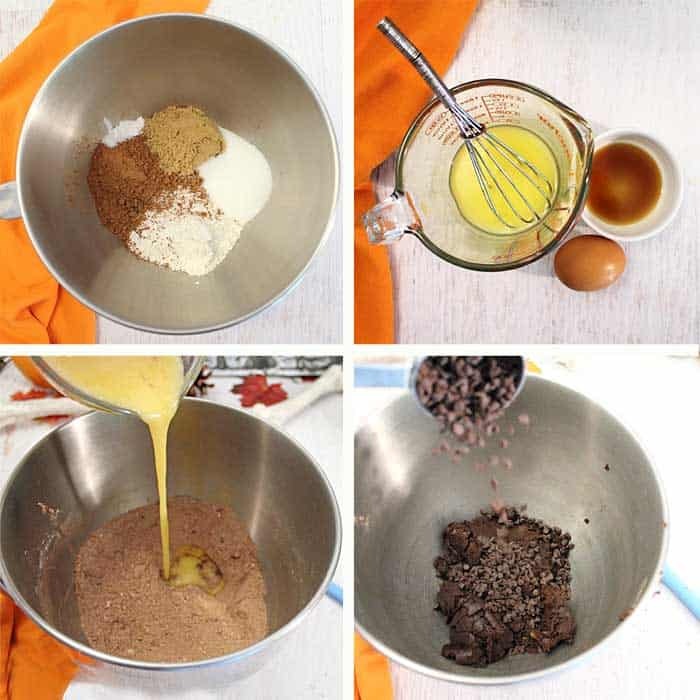 You can do all this by hand or use a stand mixer. Using a medium cookie scoop, scoop balls of dough into the bottom of each cavity. Take an insert and press down firmly into cavity all the way to bottom. Make sure to keep the insert in the center of the cavity. Bake in oven for 17-19 minutes or until the top's of cookies feel firm and dry. Remove to wire rack and trim edges of cookies that have risen above baking pan. Let cookies cool for 10 minutes then remove inserts by gently twisting. Remove cookies and let cool completely on wire rack. Pour sprinkles on to a flat plate. When cool, melt 1/2 cup chocolate in microwave. 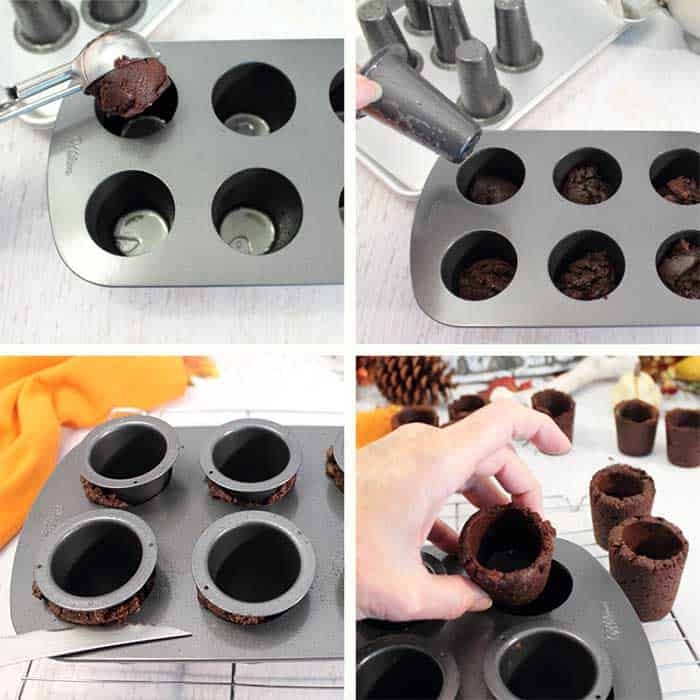 using a paint brush, brush the inside of the cookie cups making sure to coat well and seal up any cracks. Brush extra chocolate on the rims of cookie shots and dip into the plateful of sprinkles. Take a can of cherry pie filling and spoon some into each cookie shot or you can pour a shot of your favorite liqueur in just prior to sipping. Top with whipped cream, either fresh or canned. Color some of the whipped cream red or drop some red food coloring down side for blood. Insert a candy knife if you want. They are so much fun! Can’t wait to work on a Christmas version myself. These are so adorable!! :] Perfect for any Halloween party!! Those are soooo cute!! Very creative. Flavors are awesome and these look so cute! Can’t wait to try for this Halloween! I love the flavor combination of chocolate and cherry! 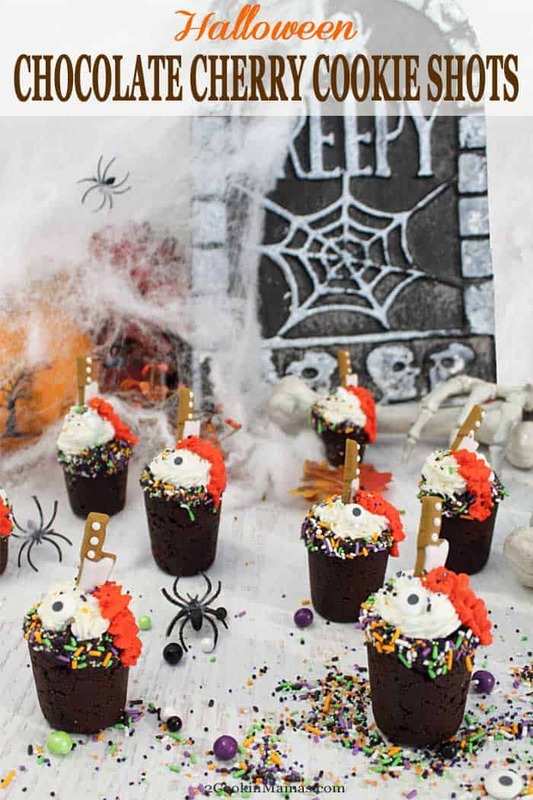 What a fun and creative way to make a Halloween dessert.